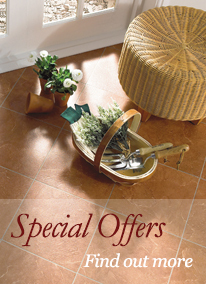 At May Flooring Ltd, we supply and install a wide range of Domestic Vinyl flooring to suit any requirements. Vinyl ranges from luxury vinyl tiles or planks to sheet vinyl. Vinyl flooring is comfortable, soft and warm to the foot. It is a practical option of flooring especially in wet areas such as Kitchens, Utility rooms, Bathrooms or Cloakrooms with its slip resistant properties. It is easy to clean making it the popular choice of many families. The subfloor preparation is very important when installing Vinyl Flooring to give an optimum finish. Our estimate will include and detail the preparation work we recommend. This could include damp proof membrane, plywood, latex or water-based levelling screed. We supply and install well known quality Domestic Vinyl Flooring products meeting the recommended standards. Some of the manufacturers we use are: Altro, Amtico, Avenue, Beauflor, Forbo, Gerflor, Itec, Karndean, Leoline, Marmoleum, Novilon, Polyflor, Rhinofloor, Tarkett and many more. For more information on Domestic Vinyl Flooring please contact us or call us on 01635 32999 to discuss your requirements.